Do You Motivate Your Cleaning Employees With Trust Or Fear? "This week has been a rush. I had 7 appointments, submitted 4 breathtaking proposals (this is what the prospect said), and got 4 more for next week. I just needed to share that with my thejanitorialstore.com family. I am getting excited about how things are starting to come along. Its been a slow 4 months but now I am getting a rush. Thank you Steve, Jean and everyone else who contributed to the site to help my business grow." I've seen SO many people struggle with their business for a few months and then decide to hang it up. 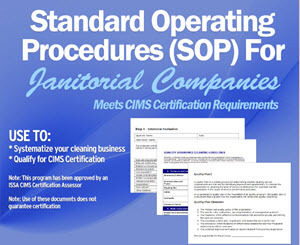 It's pretty easy to do in this industry because it's fairly inexpensive to start a cleaning business. So if it fails, "Oh well, I didn't have that much invested in it anyway". A certain percentage of these people never put much effort into it to begin with. But there ARE people who work hard marketing the business for months but see little return on their time investment. What some of these people never realize is, they gave up right before the floodgates were about to open! What if they had stuck it out just a little longer? As you can see by our member above, a wave of prospects came to her after a very slow 4 months. I've seen lots of examples just like this one. It happened to us when we started our second cleaning company. We finally got our first client after 4 months, and after 6 months the floodgates finally opened. Within a year we had momentum and a steady stream of prospects. So for those of you considering giving up, re-think that notion if you KNOW you've been putting in the effort to network and get your name out there. Your success could be just around the corner! If you have a similar story, please click on the Comments link below to share your story. I can agree with everything that is well said above. If someone starts a business, giving up is the last option and certainly not an option with less than a year's time. Now playing devil's advocate ... There is a point in many businesses life when hanging on is not wise. My habit is to hang on too long and then have no recourse. When the reasons for ending a business are from outside forces ... economy, loss of workforce, low margin bids, or other issue (some in our control, some not) a realistic approach is in order. Getting someone involved that is not financially connected that can look at the books and personnel and give good advice can be a good strategy. A business mentor, if you will. Great inspirational message, Jean. Thanks, we need to hear these stories from time to time. Great Inspiration! 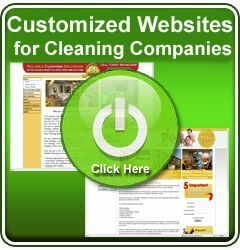 I just started my cleaning business about 3 months ago and this really helps me! Great inspirational, i am a prime example of that, i been doing the cleaning business on and off for the past 3 years, i go out and net work with as many prospects as i posibly can for like 3 or 4 months and i prety much get nothing in return, so i kinda run low on mony and have no choice but to fall back to my roots working in a restaurant 60 to 70 hr a week. Finaly when i start working in a restaurant proscts that ive net worked with start calling almost everyday i get phone calls and dont have the time to anser the phone or give them the attntion they need since i am in the kitchen cooking. This happened 3 times alread qiut restaurant and get back to cleaning and qiut cleaning and get back to the restauran lol. well i gues you just have to tough it out and stick with your strategy.